What a difference a week makes in the northland’s weather! We were wishing for spring and it got here – or tried to – as quickly as it could. Always amazes how we can go from single digits one day to 40 degrees the next. Suddenly everything was melt, melt and more melt prompting worries over flooding. Roofs that were caked with snow had none. I sat bolt upright in the middle of the night as the snow came tumbling off my metal roof. Whoosh, bang….gone! It was now lodged halfway out in my driveway. Then hearing something and wondering – what is that? Going to the door and realizing it’s rain! A sound not heard for a while. Ahhh….into the season of mud we go….. I asked Jerry Jossart if there was anything new going on in the village. He replied, with a smile, “Well, I’ve been having leg cramps.” Donning my serious reporter face, I asked, “Pickle Ball or shoveling?” (Jerry is an avid Pickle Ball player.) With a thoughtful look, he said, “Probably both.” Gotta love small town news! We decided to cancel the Community Club meeting for this month due to the foggy, icy, sloppy conditions. Not to mention that the entire parking lot at the Club was suddenly underwater. So, we’ll postpone the giggles until next month when the meeting will be held Thursday, April 11th. I’ve heard reports of a few animals, such as skunks, waking from their winter slumbers. Wonder if the bears can be far behind? Still a lot of snow out there so maybe they will stay denned up for a while. With temps nearing 50 degrees by the end of next week….who knows? I would like to bid farewell to one of our longest residents. Pat Reinders has sold her home and will be moving down to Sheboygan to be near her daughter Kate Alden. I have known Pat since I was a young girl coming up to stay at our place near the Buffalo Lake Resort. Her and her family spent their vacations there. In 1968 (51 years ago!) they bought the Clam Lake Store and became residents. One year later, my family would buy the Texaco Station and move north permanently. She told me she will be coming up off and on to visit so this is not good-bye – just the start of a new adventure. We will all miss her! Lots of memories! Until next week….enjoy the warmer temps, be careful on icy walkways and think happy thoughts. 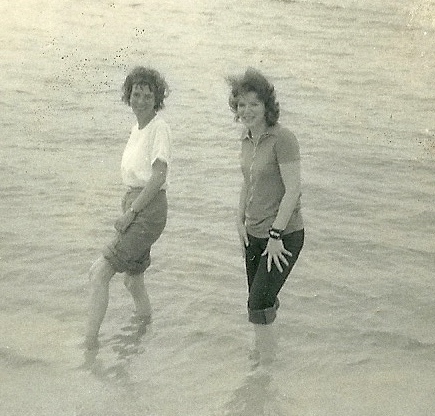 Pictured are Tish Holter and Pat Reinders in Pensecola, Florida during the 1970’s where they participated in testing (self-proclaimed “guinea pigs”) done by the Navy regarding Project ELF. They did this for five years.